Nitra is a city in western Slovakia, situated at the foot of Zobor Mountain in the valley of the river Nitra. Do some cultural sightseeing at Cachtice Castle and Banskostiavnicky Betlehem. Get some historical perspective at Beckov castle and St. John the Baptist Cathedral. You'll find plenty of places to visit near Nitra: Trnava (Church of St. Helena & St. Nicholas Basilica), Cerveny Kamen Castle (in Cerveny Kamen) and Banska Stiavnica (Open-Air Mining Museum (SMM) & Kalvaria). 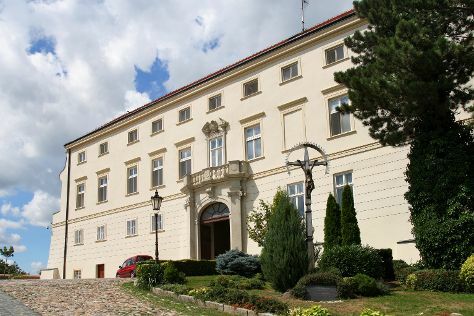 There's more to do: step into the grandiose world of Nitra Castle and examine the collection at Diecezne Muzeum. For more things to do, traveler tips, maps, and more tourist information, go to the Nitra travel guide. Use the Route module to find travel options from your starting location to Nitra. In July, daytime highs in Nitra are 32°C, while nighttime lows are 19°C. Finish your sightseeing early on the 16th (Sat) so you can travel back home.